Especially for undergraduate students but not just, the concepts of unbiasedness and consistency as well as the relation between these two are tough to get one’s head around. My aim here is to help with this. We start with a short explanation of the two concepts and follow with an illustration. for the usual least square estimator this means that . Note this has nothing to do with the number of observation used in the estimation. 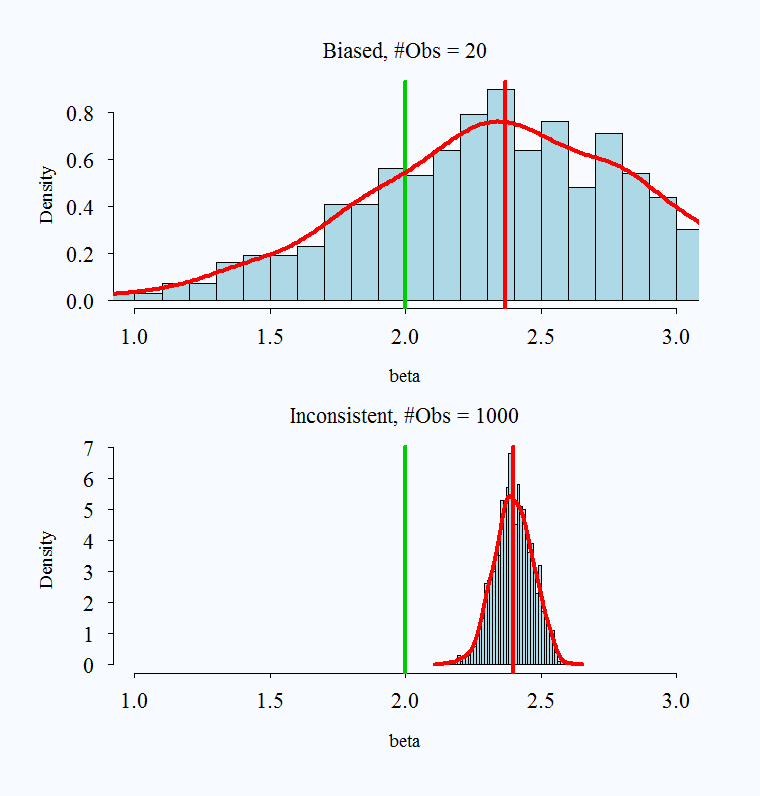 Better to explain it with the contrast: What does a biased estimator mean? An estimator depends on the observations you feed into it. For instance, depends on the sample (X,y). For different sample, you get different estimator . This means that the number you eventually get has a distribution. I think this is the biggest problem for graduate students. Most of them think about the average as a constant number, not as an estimate which has it’s own distribution. The average is sample dependent, and the mean is the real unknown parameter and is constant (Bayesians, keep your cool please), this distinction is never sharp enough. 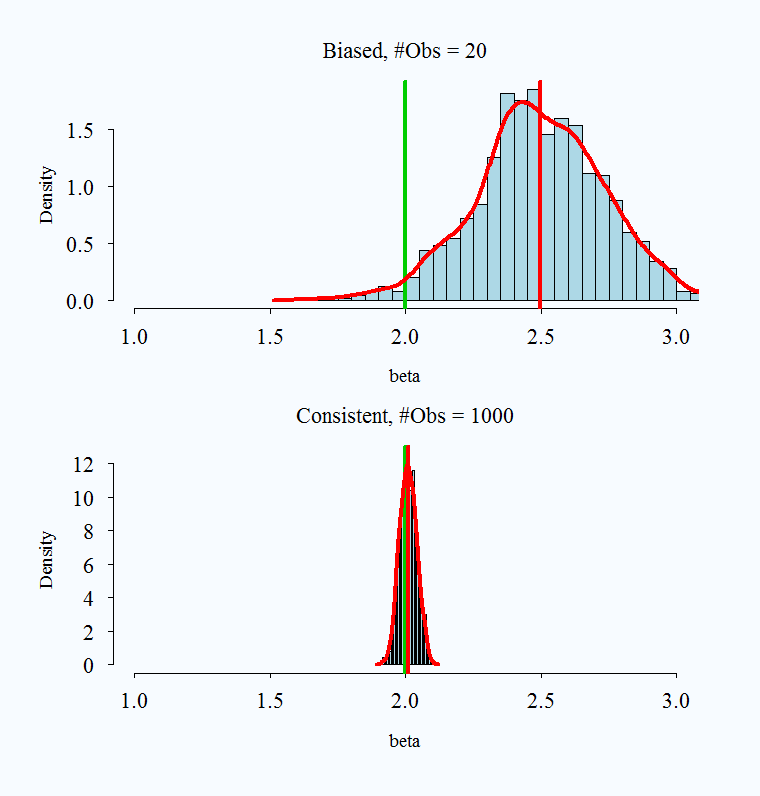 A biased estimator means that the estimate we see comes from a distribution which is not centered around the real parameter. Why such estimators even exist? Why shouldn’t we correct the distribution such that the center of the distribution of the estimate exactly aligned with the real parameter? The answer is that the location of the distribution is important, that the middle of the distribution falls in line with the real parameter is important, but this is not all we care about. Our estimate comes from the single realization we observe, we also want that it will not be VERY far from the real parameter, so this has to do not with the location but with the shape. Sometimes we are willing to trade the location for a ‘better’ shape, a tighter shape around the real unknown parameter. Imagine an estimator which is not centered around the real parameter (biased) so is more likely to ‘miss’ the real parameter by a bit, but is far less likely to ‘miss’ it by large margin, versus an estimator which is centered around the real parameter (unbiased) but is much more likely to ‘miss’ it by large margin and deliver an estimate far from the real parameter. You see, we do not know what is the impact of interest rate move on level of investment, we will never know it. We only have an estimate and we hope it is not far from the real unknown sensitivity. That is why we are willing to have this so-called bias-variance tradeoff, so that we reduce the chance to be unlucky in that the realization combined with the unbiased estimator delivers an estimate which is very far from the real parameter. meaning that it is consistent, since when we increase the number of observation the estimate we will get is very close to the parameter (or the chance that the difference between the estimate and the parameter is large (larger than epsilon) is zero). A mind boggling venture is to find an estimator that is unbiased, but when we increase the sample is not consistent (which would essentially mean that more data harms this absurd estimator). (1) In general, if the estimator is unbiased, it is most likely to be consistent and I had to look for a specific hypothetical example for when this is not the case (but found one so this can’t be generalized). Hopefully the following charts will help clarify the above explanation. The real parameter is set to 2 in all simulations, and is always represented by the green vertical line. The red vertical line is the average of a simulated 1000 replications. You see here why omitted variable bias for example, is such an important issue in Econometrics. The fact that you get the wrong estimate even if you increase the number of observation is very disturbing. On the obvious side since you get the wrong estimate and, which is even more troubling, you are more confident about your wrong estimate (low std around estimate). Just a word regarding other possible confusion. Papers also use the term ‘consistent’ in regards to selection criteria. Selection criteria deliver estimate but for a structure, e.g. exact number of lags to be used in a time series. In those cases the parameter is the structure (for example the number of lags) and we say the estimator, or the selection criterion is consistent if it delivers the correct structure. For example the AIC does not deliver the correct structure asymptotically (but has other advantages) while the BIC delivers the correct structure so is consistent (if the correct structure is included in the set of possibilities to choose from of course). An even greater confusion can arise by reading that “LASSO is consistent”, since LASSO delivers both structure and estimates so be sure you understand what do the authors mean exactly. Code needed in the preamble if you want to run the simulation. yt=B1+B2*(1/t)+ut with idd ut has unbiased Bs but inconsistent B2. In the book I have it on page 98. Yeah, nice example. Thanks for this. Repet for repetition: number of simulations.